Khaled Anatolios, Athanasius: The Coherence of His Thought (Routledge Early Church Monographs Series; London: Routledge, 1998; paperback 2005), 258 pp. Khaled Anatolios (ed. ), Athanasius (Early Church Fathers Series; London: Routledge, 2004), 293 pp. In the first of these two books, Athanasius: The Coherence of His Thought, the brilliant young theologian Khaled Anatolios offers a close analysis of the internal “grammar” of Athanasius’ thought. The study focuses consistently on what Anatolios sees as the centre of coherence in Athanasius’ theology: “the distinction, and simultaneous relation, between God and the world” (p. 3). This is an essentially Irenaean reading of Athanasius, and Anatolios argues that Athanasius is deeply indebted to Irenaeus’ theology (or at least to an Irenaean tradition), with its underlying theme of an immediate relation between God and creation. Athanasius’ own ontology is based on a conception of “the relationship between God and creation, precisely in the radical opposition of created to uncreated” (p. 31). In his early works, Athanasius developed a fundamental ontological structure which would underpin all his later theology: namely, a structure of convergence between God’s transcendence and nearness. In the act of creating, “God asserts his transcendence over that which he brings into existence from nothing, as well as demonstrating his love which leads him generously to grant existence to what was not” (p. 41). This view of the convergence between transcendence and immanence shapes Athanasius’ christology. God’s redemptive work in Christ follows the pattern of God’s relationship to the world as creator; it is in Christ that the distance between the world and God is both affirmed and traversed. Likewise, the total otherness between Christ’s two natures is decisively “bridged over” by the initiative of grace (p. 83). In his mature anti-Arian writings, Athanasius develops his trinitarian theology on the basis of this same structure of transcendence and nearness. At the heart of his doctrine of the Trinity is the idea that “the relation between God and the world is both contained in and superseded by the relation between the Father and the Son” (p. 120). God’s (free and external) creative act is grounded in God’s (necessary and internal) act of generating the Son, so that the relation between God and creation is “contained or ‘enfolded’ within the intra-divine relation of the Father and the Son” (p. 123). Further, the incarnation of the Word modifies the relationship between God and creation at every point. Indeed, Athanasius is not interested so much in describing the specific constitution of Christ’s person as he is in describing “the new relation between God and creation that is given in Christ” (p. 146). In Christ, the God-world relation is “divinised,” and the christological model of this divinisation is a pattern of God’s (active) “giving” and the creature’s (passive) “receiving.” It is thus precisely God’s “gift” (χάρις) that radically qualifies the distinction and separateness between God and created nature. If Athanasius conceives of christology in terms of giving and receiving, he also views anthropology in terms of “active passivity” (p. 60) – a passivity in which human agents maintain their proper openness towards the active giving of God. Nevertheless, this account of human passivity does not preclude a strong emphasis on the co-operation between humans and God. The fundamental model of this “synergy” is, for Athanasius, prayer: “Prayer, understood as the invocation of divine presence and assistance, is the human counterpart to the divine power” (p. 186). Prayer is thus active passivity; it is receptivity and openness to the initiative of the divine generosity. Anatolios concludes his study by proposing that Athanasius’ theology offers a valuable resource for the contemporary theological task of articulating the Christian gospel. He suggests that Athanasius’ model of the relation between divine transcendence and nearness steers a safe course between both the “anthropocentric monism” of Schleiermacher and the “incipient dualism” of Barth. That is, Athanasius’ model “succeeds in affirming both the ineffable, sovereignly free and transcendent being of God (with Barth) and the nearness of this ineffable presence within the human realm (with Schleiermacher)” (p. 209). Even if this account rests on a rather schematic critique of Barth and Schleiermacher, Anatolios has convincingly demonstrated the powerful insight and the continuing dogmatic significance of Athanasius’ ontology. Furthermore, this very fine study is now complemented by Anatolios’ impressive edition, simply entitled Athanasius. This work brings together new translations of some of Athanasius’ most important writings. There are selections from the Orations against the Arians (pp. 87-175) and Letters to Serapion on the Holy Spirit (pp. 212-33), together will the full texts of On the Council of Nicaea (pp. 176-211) and Letter 40: To Adelphius (pp. 234-42). Anatolios introduces each text and provides extensive annotations, and he introduces the whole collection with an excellent overview of Athanasius’ life and thought (pp. 1-86). In this lengthy introductory essay, he emphasises (as in the monograph) the God-world relation as the structuring principle of Athanasius’ theology. 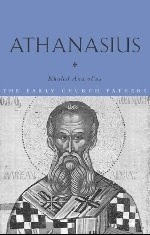 But he also places special emphasis on the christological and soteriological character of the relation between God and creation – and he surveys the whole broad terrain of Athanasius’ thought, demonstrating the sharp christological and soteriological concentration of that thought at every point. Together, these two works by Khaled Anatolios offer a lucid, compelling and richly rewarding account of the thought of the great Egyptian bishop. Anatolios’ deep learning and profound sympathies with his subject make his work an indispensable guide to Athanasius’ theological thought.